Past practices offer few clues about where special counsel Robert Mueller might take the Russia probe — and then what might happen when it's over. 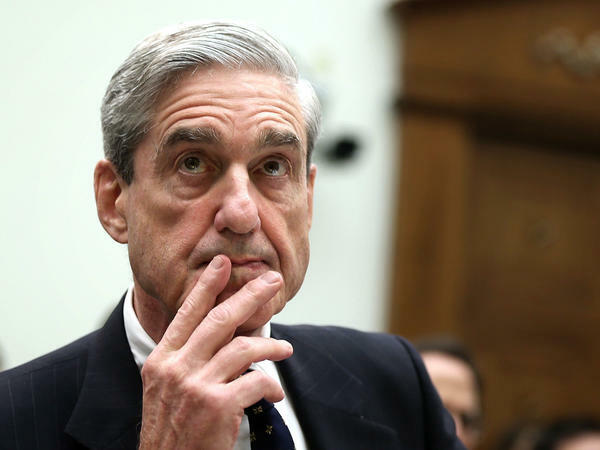 NPR Justice Correspondent Carrie Johnson sat down with the host of NPR's Embedded podcast, Kelly McEvers, to look at what Mueller's track record could reveal about the possible outcomes of the investigation. Listen to the full episode here. There's been considerable speculation over whether or not the special counsel will interview President Trump under oath. Lawyers inside the White House are negotiating terms with Mueller's office. Last month, the president told reporters he was "looking forward to it." As far as we know, it has not taken place so far. There are several ways it might happen. First, if the president sits for a voluntary interview, he could do so in the White House, with his lawyers already having struck a deal around permitted topics of questioning. Trump's lawyers could be present, issuing objections and guiding the conversation. This scenario, however, could still present pitfalls for Trump. Even if he didn't do anything wrong — anything at all — if the president were to misstate something or make an intentionally false statement, he could create a legal problem for himself. If the president refuses the voluntary sit-down option, the special counsel team could issue a grand jury subpoena in an effort to force Trump to appear at a federal courthouse – and that could be a historic spectacle. There are numerous downsides for the president in this scenario. Trump would have to appear before the jury alone. The president also would have to take an oath before a jury, without any lawyers by his side. That has the potential to go south for any witness let alone the president of United States. The president could, in fact, resist both options and simply refuse to talk. Everybody has constitutional rights. One of them is the Fifth Amendment right to remain silent. Declining an interview might be political suicide for most politicians, but Donald Trump is not most politicians. It's not clear whether his base of supporters would be bothered if he decided to 'take five,' as courthouse insiders say — especially since Trump has said he wants to talk and might be in a position to blame his lawyers for the decision if he doesn't. Regardless of what Mueller does or does not discover, it's not clear what might become of his findings. As a special counsel — not an independent counsel, which both Archibald Cox and Kenneth Starr both were when they investigated President Nixon and President Clinton — Mueller has "less formal independence," as NPR reported last year. Mueller was appointed by and directly reports to Deputy Attorney General Rod Rosenstein. Attorney General Jeff Sessions recused himself in March from all matters relating to Russian election interference. Whenever Mueller concludes his investigation, he will likely issue a report to Rosenstein, who will be the one to ultimately decide what the world learns of it. It's not clear whether that report would become public. Rosenstein has had a lot of power since May 2017, when he appointed Mueller. He's going to continue to have a lot of power over what the public learns about what Mueller is doing until Mueller's work is done. There are thorny legal issues around what from the report could go public. For instance, evidence obtained via a grand jury could be subject to grand jury secrecy rules. And if Mueller were to uncover damning information about Trump or his staff but did not seek to bring charges against them, supporters would cry foul if Rosenstein revealed the findings anyway. That's what happened before: Rosenstein criticized former FBI Director James Comey's decision to discuss Hillary Clinton's email controversy without bringing charges. "The director ignored another longstanding principle: we do not hold press conferences to release derogatory information about the subject of a declined criminal investigation," Rosenstein wrote in May in a memo released on the day of Comey's firing. In trying to assess whether or not Rosenstein or Mueller are likely to make splashy disclosures, it is worth considering their temperaments. They are careful guys. They're going to think about the Justice Department and the FBI as institutions and how to preserve the integrity of those institutions. Congress, however, can do whatever it wants. Even if official disclosure from the Justice Department is limited, lawmakers on Capitol Hill may haul up senior DOJ leadership and maybe even Mueller to talk about what he did or didn't do and why. People on the left and the right have both asked – for different reasons – whether Mueller's investigation could lead to Trump's impeachment or even indictment. Right now, no one knows the answer, and it could be months or years before one comes into focus. One thing that is clear now: the Justice Department's Office of Legal Counsel has determined that a sitting president cannot be indicted. So for Trump to face indictment in the near term, he would need to face impeachment first. That would require the House of Representatives to receive material from Mueller via the Justice Department, accept it and act on it. The Senate would then have to try Trump and vote on whether to remove him from office. The Republicans who control Congress today appear unlikely to go along with any of this. But some of them – and allies such as former White House chief strategy Steve Bannon – have picked up the impeachment thread in their own campaigning. Texas Sen. Ted Cruz invoked the I-word in warning about what he called an immigration proposal that was too liberal for most Republicans. "Mark my words, if Republican majorities in Congress pass citizenship for millions of people, an amnesty, I think it is quite likely we will lose both houses of Congress and Speaker Nancy Pelosi will impeach President Trump," Cruz said. Pelosi and Senate Democratic leader Chuck Schumer have downplayed the impeachment storyline, saying they'd have more urgent priorities if Democrats retake control of Congress. Meanwhile, however, billionaire Democratic backer Tom Steyer is running his own public campaign on behalf of impeachment. Whatever happens, Mueller's team has demonstrated an amazing ability to hold information tightly. His attorneys and investigators may be the only people who have a complete sense of what's coming next in this story. Special counsel Robert Mueller is investigating several threads. The recent indictments of Russian businesses and individuals who tried to influence the 2016 election is just one of them. Another is this. What happened after President Donald Trump was elected? It's about obstruction of justice - any attempt to impede or hinder an investigation with what's known as corrupt intent. The idea is that President Trump has allegedly tried to thwart the Russia investigation. For the podcast Embedded, host Kelly McEvers and NPR justice correspondent Carrie Johnson take a look back at the relationship between Trump and former FBI Director James Comey, interactions that some legal scholars say could now be part of the growing evidence for possible obstruction. KELLY MCEVERS, BYLINE: One of the first major interactions between Trump and Comey is in February 2017. The president's national security adviser, Michael Flynn, has just been fired for lying about a conversation he had with the Russian ambassador to the U.S. And Trump knows Flynn has been interviewed by the FBI. Carrie Johnson picks up what happens next at this February meeting. And you will hear testimony Comey later gave before a Senate subcommittee. CARRIE JOHNSON, BYLINE: FBI Director Jim Comey is at the White House for a big briefing on counterterrorism. JOHNSON: Whole bunch of people are there - the president of the United States, Vice President Mike Pence, presidential aide and son-in-law Jared Kushner, Attorney General Jeff Sessions and others. This meeting breaks up, and the president's signals to Comey that he wants to talk to Comey alone. JAMES COMEY: My impression was something big is about to happen. I need to remember every single word that is spoken. JOHNSON: And Attorney General Sessions, by Comey's account, and Jared Kushner kind of linger for a while at the table. COMEY: My sense was the attorney general knew he shouldn't be leaving, which is why he was lingering. And I don't know Mr. Kushner well, but I think he picked up on the same thing. JOHNSON: They knew maybe he shouldn't be meeting alone with the president, but they didn't wind up doing much about it. COMEY: And so I knew something was about to happen that I needed to pay very close attention to. JAMES RISCH: Quote - this is the president speaking - "I hope..."
MCEVERS: This is Republican Senator James Risch reading from Comey's own notes. RISCH: "I hope you can see your way clear to letting this go - to letting Flynn go." JOHNSON: I hope you can see your way clear to letting this go - to letting Flynn go. He's a good guy. RISCH: "He is a good guy." JOHNSON: I hope you can let this go. RISCH: "I hope you can let this go." JOHNSON: Comey understands this to mean a request from the president of the United States to the FBI director to back off the Flynn investigation. MCEVERS: Some say this could be part of the evidence for possible obstruction. Republicans at this Senate hearing do not think this was a request from the president of the United States to, quote, "back off" the investigation. And here's some more from that hearing. RISCH: OK. You don't know of anyone that's ever been charged for hoping something. Is that a fair statement? RISCH: You don't. Thank you. Thank you. JAMES LANKFORD: The key aspect here is if this seems to be something the president's trying to get you to drop it, this seems like a pretty light touch to drop it, to bring it up at that moment the day after he had just fired Flynn, to come back in and say, I hope we can let this go. But then it never reappears again. Did it slow down your investigation or any investigation that may or may not be occurring with Michael Flynn? MCEVERS: That was Republican Senator James Lankford. And we asked him about this line of questioning later. LANKFORD: For someone like President Trump that is notorious for being very, very blunt when he wants to be blunt, that seemed to be an awful light touch for him. MCEVERS: So you're saying if he wanted to get involved in this investigation in that moment, he would have just said it straight up. LANKFORD: My perception of the president is if he has something in his head that he wants to say bluntly and clearly, he has the capability to do that. MCEVERS: So you don't think he obstructed justice then. LANKFORD: I don't based on that dialogue and that conversation. I don't hear obstruction of justice in that. What I hear is someone saying, gosh, I wish this was different, but it's not. UNIDENTIFIED REPORTER #2: The fallout now after the firing of FBI Director James Comey. MCEVERS: At first the White House says it's because Comey mishandled the investigation into Hillary Clinton's emails. Then the White House says it's because FBI agents were complaining about Comey. Most legal scholars agree that a president can hire and fire who he wants. But then Trump tells Lester Holt on NBC he fired Comey because of Russia. PRESIDENT DONALD TRUMP: And in fact, when I decided to just do it, I said to myself - I said, you know, this Russia thing with Trump and Russia is a made-up story. It's an excuse by the Democrats for having lost an election that they should have won. MCEVERS: That's a big change, right? That's way different than the original justification. And why is that potentially problematic? JOHNSON: Remember; when you're thinking about things as possible obstruction of justice, there has to be some kind of state of mind. And it's a high bar to get a corrupt state of mind. The president has now said on national television that he was thinking of Russia when he fired Jim Comey, who was playing a big role in the Russia investigation. And so that doesn't get you all the way there, but it provides some insight into the president's state of mind, into his thinking. MCEVERS: At this point, May 2017, Democrats and some Republicans start to pressure the Justice Department, saying this investigation is getting too politicized. So the Justice Department appoints a special counsel to run the investigation. This is where Robert Mueller comes in. MCEVERS: And in the months since, there have been other reports that suggest possible obstruction - reports that Trump at one point wanted to fire Mueller and reports that he tried to get the attorney general not to recuse himself from the Russian investigation. So now, what if Mueller does have enough evidence for obstruction? Then what? The Justice Department says you can't indict a sitting president, so you either wait until he's not president or you pass what you have to Congress. And just remember; in the cases of the only two presidents in modern history who have faced articles of impeachment in Congress, Richard Nixon and Bill Clinton, they both included charges of obstruction of justice. So I ask Carrie Johnson about all this. I want to talk about the elephant in the room because people from every Uber driver that I ever have to, like, my relatives ask me about this. How does impeachment figure in? I think there's a large part of the voting public that thinks, oh, Mueller's going to find all this bad stuff and then he's going to hand it all to Congress, Democrats are going to win in the midterms, and then they're going to impeach Trump. And then it's all over. JOHNSON: That's a lot of ifs. MCEVERS: Tons of ifs, the biggest one of course being, do Democrats control the House and Senate? But from, like, the standpoint of an obstruction of justice case, could it even lead there? And what all would have to happen for it to do that? JOHNSON: So let's say Robert Mueller compiles a boatload of evidence. Where does he take that evidence? MCEVERS: Mueller first has to give his evidence to Rod Rosenstein, the deputy attorney general who's in charge of the investigation. Then Rosenstein decides what to do with that file. He could give it to Congress. Then the House would vote whether or not to impeach. If that vote is yes, the Senate would hold impeachment proceedings like a trial and a two-thirds majority would be needed to convict. Carrie Johnson says everyone who's imagining these impeachment proceedings should probably just slow down. JOHNSON: That's way ahead of where we are right now at this moment in time. And it requires a lot of assumptions like that there is evidence the president of the United States committed some kind of legal violation, that people in the House of Representatives are willing to accept that information and do something with it. I'm not sure that either of those things are true at the moment that we are speaking. SHAPIRO: That was NPR justice correspondent Carrie Johnson and Kelly McEvers, host of the podcast Embedded.